A time commitment of one hour per week for 12 months. 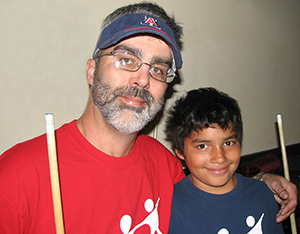 AZ STARS Mentors are thoroughly screened and trained before they are allowed to spend time with a child as a mentor. All AZ STARS mentors must complete the background check, fingerprints, and submit references. The benefit of the AZ STARS Mentoring Project is that a number of agencies are involved in the process of recruiting, training, and supporting the mentoring process. Because the mentoring relationship is so important, it takes a little extra time to make certain that the right match is made. You can expect your matching process to take approximately 60-90 days from beginning to end. The first step in the process is calling the AZ STARS Project at (520) 791-2711 ext 1410 to request more information. The AZ STARS staff will answer your questions and refer you to the website of the Big Brothers Big Sisters (BBBS) organization nearest to you. You will fill out an online application or send a printed application in the mail. The AZ STARS staff will also follow the conversation with an information packet and follow-up phone calls to see where you are in the process. Once you have completed the application (either on-line at the Big Brothers Big Sisters website or a written application) and have submitted that application to the AZ STARS Office or to BBBS, you will be contacted to schedule an intake interview. The children and families wanting mentors are also interviewed to identify interests and needs. The AZ STARS collaboration uses this information to get to know you and the family a bit better and determine the best match. Once that interview is completed, then the staff begins the process of reviewing all of the files to find possible matches based on your application and interview. Once a possible match is found, you will be notified by a case manager and a meeting will be set up between the mentor, the child, and the family caregiver. At your first meeting you will have the chance to "check each other out" and see how you match up. All matches will be assigned a case manager through Big Brothers Big Sisters. Your case manager will contact you regularly to see how the match is progressing, let you know about upcoming activities, and make certain that things are running smoothly. Please remember that this matching process takes time, and your patience is appreciated. If you have any questions during the process please feel free to contact the AZ STARS project at (520) 791-2711 ext 1410. Click here to read about some children currently seeking a mentor.